Bel benefits in healing digestive disorders, ulcers, headache, hypertension, diabetes, and numerous other ailments. The ripe fruit works as a laxative but is not digested easily. 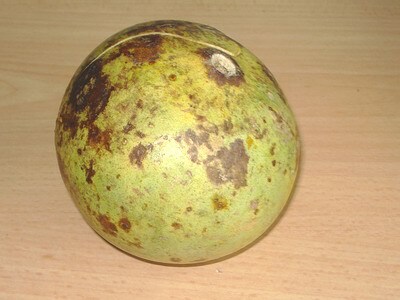 Unripe bel fruit, on the other hand, promotes digestion and cures diarrhea. Apart from the fruit, the root, bark, leaves as well as flowers of bel tree have medicinal value. Furthermore, the tree is considered sacred in Hinduism and is used for worshiping Lord Shiva. It is regarded as a symbol of riches and fertility. Scientific Name: Aegle marmelos (Corr. ), Crataeva marmelos L.
Bel tree is native to India. It is grown in India, Sri Lanka, Nepal, China, Myanmar, Bangladesh, Pakistan, Vietnam, Philippines, Thailand and Combodia. 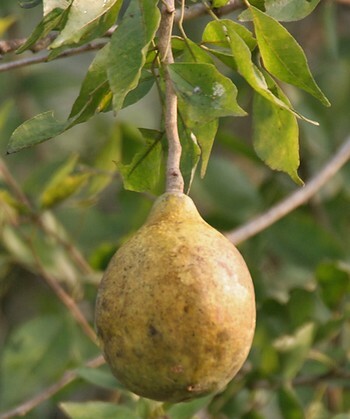 Bel or Bael belongs to the Rutaceae family. Bel has stimulant, astringent, antiseptic, anti-bacterial, anti-inflammatory, antispasmodic, antipyretic, antiemetic, carminative, stomachic, diaphoretic, expectorant, and diuretic properties. The aromatic and cooling fruit is usually smooth and woody. Different parts of this tree have different medicinal qualities. Bel purifies blood and cools the body. Moreover, it is considered good for heart and brain. Ripe bel fruit cures constipation as it works as a laxative and tones up the intestines. However, as the ripe fruit is heavy and difficult to digest, it is mostly taken in the form of a sherbet. The unripe or half-ripe fruit is excellent for treating diarrhea, aiding in digestion and improving appetite. Besides, bel benefits in relieving peptic ulcers, indigestion, intestinal worms, acid reflux, cholera, colitis, hepatitis, and so on. Plus, it reduces intestinal spasms caused by Irritable Bowel Syndrome and Crohn’s disease. Its leaves are useful for controlling diabetes, treating kidney problems, increasing hemoglobin in blood, fighting infections, healing jaundice, relieving headache, etc. In addition, the leaves help lower high blood pressure and provide relief from menstrual problems. Another benefit of bel leaves is that they can be used as poultices for getting rid of inflammations. Bel also provides relief from cough, cold, asthma, bronchitis, influenza, and other similar respiratory disorders. Applying a paste prepared from powdered root and butter on soles is an effective bel home remedy for inducing sleep. Besides, the rind of bel fruit benefits in reducing dandruff. Coming to the nutritional benefits of bel, it is rich in proteins, carbohydrates, vitamin C, calcium, iron, phosphorus, carotene, thiamin, riboflavin, and niacin. Furthermore, studies are being conducted to analyze its radio-protective effects that can be used for reducing the side effects of radiotherapy. • Consuming about 20 ml juice extracted from bel leaves is valuable in managing diabetes and reducing excess urination. • Boil a cup of water mixed with half or one teaspoon of dried bel leaves. Finally, cool and strain the liquid. Drink this solution three times in a day to reduce hypertension. • Eating a combination of ripe bel fruit pulp, sugar and honey regularly after dinner is useful in early stages of tuberculosis. Follow this procedure for about 40 days. • Taking a teaspoon of dried and powdered bel leaves for three days helps in increasing appetite. 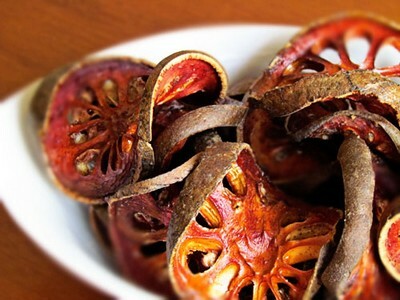 • Anti-parasitic benefits of bel can be derived by taking about five grams of dried and powdered pulp of the fruit. Follow this therapy two times in a day to eliminate intestinal worms. • Crush an unripe bel fruit along with one teaspoon each of dried ginger and fennel. Soak this mixture in four cups of water and drink this home medicine three to four times in a day to heal hemorrhoids. • Another bel remedy for hemorrhoids involves the intake of a combination of dried and powdered bel leaves, dried ginger, carom seeds, and black pepper mixed in a glass of buttermilk. If you do not have buttermilk, use lukewarm water. 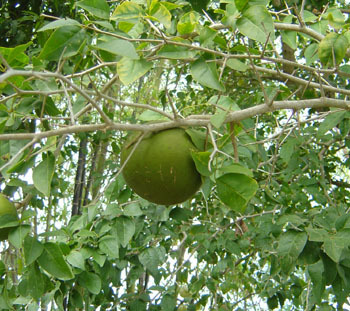 • Consuming a cup of ripe bael fruit mixed with jaggery once daily for 2-3 months heals constipation and indigestion. It also cures mouth ulcers. You can eat almost 70g of this pulp in a day. • Having a teaspoon of dried and powdered ripe bel fruit pulp mixed in a glass of buttermilk or warm water is two times in a day is valuable in relieving spasms caused by irritable bowel syndrome. • When dealing with acute or chronic diarrhea, dry the slices of an unripe bel fruit in sun and grind them. Take a teaspoon of this powder along with warm water. Follow this therapy two times in a day. • Bel health benefits for reducing excessive menstruation can be derived by having a teaspoon of crushed bel leaves along with warm water followed by the intake of some cold water. • Add a pinch of black pepper in a teaspoon of crushed bel leaves and consume this mixture. Finally, drink a cup of buttermilk. Follow this natural treatment three times in a day to help cure jaundice. • Heat the rind of bel fruit in coconut oil and apply the oil on your scalp on a regular basis to treat dandruff naturally. In case coconut oil is not available then use sesame seed oil. • Bel benefits in healing stomach and mouth ulcers, too. For this, you need to consume a mixture of a cup of bel fruit pulp and a teaspoon of sugar in the morning on an empty stomach for three days. • Another suggestion to reduce peptic ulcers involves soaking a couple of bael leaves in a cup of water overnight and drinking this solution early in the morning for a few weeks. • To alleviate issues like nausea, vomiting and headache during summers, roast a handful of bel leaves in a mud pot, add a cup of water in it and let the mixture boil. Next, strain the solution. You can also sweeten it with sugar. Drink half of this liquid in the morning and the other half in the evening. Continue this procedure for 21 days. • Early in the morning, on an empty stomach, eat a bel leaf along with 3-4 black peppercorns and drink a cup of warm milk afterwards. Follow this remedy for at least one month in order to cure asthma. • Heat sesame oil mixed with black cumin, black pepper and juice extracted from bel leaves. When it is bearably warm, massage it on your head to relieve cough and cold. • When dealing with malaria, extract some juice from bel flowers and holy basil leaves. Mix one teaspoon each of both these juices and a teaspoon of honey. Take this home medicine two times in a day. The pulp of this fruit is used for making squash, nectar, jellies, marmalades, and candies as well. Moreover, the mucilage around unripe seeds of bel fruit is used as adhesive and glue. Excessive consumption of bel home remedies prepared from bel leaves may give rise to carcinogenic effects as the leaves are rich in tannins. Excessive use these leaves can increase the risk of abortion in women. Although bel benefits in healing digestive disorders, the fruit should not be taken in large doses over a period time as it can cause bloating, flatulence, and upset stomach. Sir/Ma’am I want to know how to use the dry powder of bel phal. I want to know where to buy or Get Bili Patra- Leaves Powder ??? Name Of Product and the company that makes or the supplier who sells it. Please…! very nice details about bel. Pl let me know from where to get fruit ?